Celebrating its 10th year in the city, the annual London Burlesque Festival is back with an outstanding line-up. Billed as the world’s largest festival of its kind, this salute to all things burlesque is held in Camden and has evening shows, bonanzas and dancing spectaculars to please everybody’s taste. And if you’re a true fan, there’s a daytime event with fashion shows, workshops, cakes and cocktails to allow you to fully immerse yourself into the glamorous and glitzy world of burlesque. The full festival schedule can be found here. For those who prefer to avoid the more well-known festivals in London, we give you Peckham Rye Music Festival – a celebration of the local music scene. The three-day long event brings together artists, labels and record stores based in Peckham’s corner of the capital as well as a number of exciting international acts. A day of music production workshops will take place on the Friday followed by the launch party. The main festival line-up will then take to the stage all day and night Saturday, with some chilled out vibes in more intimate venues on the Sunday. Grab your ticket, here. Up for a more traditional English festival, based in the heart of the urban surrounds of London? We’ve found it! A traditional village fair with a contemporary twist, get ready to celebrate the best of local design, music, art and crafts at the Urban Village Fete. 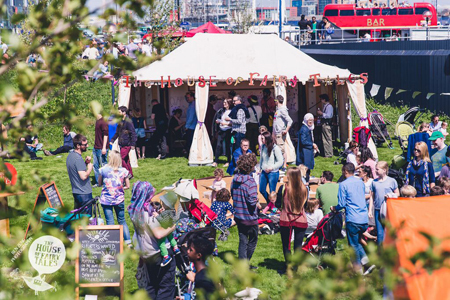 The Sunday afternoon shindig on Greenwich Peninsula will offer a bunch of local talent, a range of workshops as well as a whole load of food and drinks vans to keep the party going. With more than 10,000 people attending last year, we think it’s one for the diary to keep you entertained on a sunny day in May! After a successful launch last year, Photo London returns and is fast establishing itself as one of the top photography events in the UK. If you’re into taking photos yourself, or you’re somebody who can appreciate a picture-perfect shot, we’d thoroughly recommend heading down to the four-day festival at Somerset House. The exhibition is set to combine an array of the city’s local talent with the work of some of the world’s leading photographers. With London’s dynamic photography community bursting at the seams, we’re sure it’ll be a popular one. Check out the programme of events. Last, but by no means least, why not let your hair down and get involved in this week-long celebration of London’s wine scene? Sounds rosé to us! For those of us who like to wind down with a glass of the best, the events lined up for this festival will have the wine in full flow! From rooftop barbecues and tasting sessions to dinners and parties, you’re bound to find something to suit you and your wine-loving buddies. With multiple partner winemakers, bars and restaurants involved, you almost certainly need to check it out! Have you spotted any festivals of the more unusual kind lined up for this summer in London? Leave a comment below and let us know!